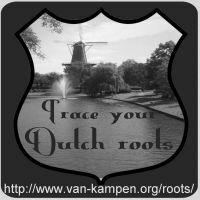 This guide aims to give you an introduction into the main sources for Dutch genealogy research. Many of the sources mentioned on this page have been microfilmed by the LDS; copies of these films can usually be consulted in their family history centres worldwide. Contact your local FHC for details. The civil register was introduced in 1811, during the brief French occupation of The Netherlands (1810-1813), and exists basically unchanged until the present day. Since 1811, marriages have to take place before the magistrate, and for each marriage, an act of marriage is written into a marriage register. All births and deaths have to be reported within three working days, and acts are written into the relevant registers. Birth, death and marriage acts are by far the most important sources for 19th and early 20th century genealogy research. Other registers exist, but they are of less importance to us. The registers were closed at the end of each year, and an index was added to the birth, death and marriage registers. New registers were started at the beginning of the next year. To be able to find acts without searching each yearly index, a large index was compiled every ten years - the so-called tientarige tafels (ten-yearly tables). The first of these was compiled after 1822, and covers the period 1813-1822. Until recently, these indexes were the best way to find your ancestors in the civil register, but currently many digital indexes exist, often available on the internet, on websites like Wie Was Wie. See Online research for more information. Birth, death and marriage registers were kept in duplicate: One copy for the local magistrates, and one for the arrondissementsrechtbank (district court). Currently, one copy is kept in the provincial archive, the other usually in a local or regional archive. Other registers and marriage supplements are kept in the provincial archives. Note that each municipity kept its own register: There is no central death or marriage register in The Netherlands! The contents and form of acts varied from one town to the next, and changed over time. Rules were sometimes strictly adhered to, and sometimes freely interpreted - this, too, seems to differ from place to place and from period to period. Rules also changed, in particular the rules about genders of declarants and witnesses have been dropped in the mid-20th century. As The Netherlands were part of the French Empire from 1810 until 1813, acts from this periods should be in French, though acts in Dutch do exist. From 1813, all acts should be in Dutch. Births had to be registered within three working days, by the father or by someone present at the birth. A birth act usually contains the name, age, occupation and sometimes address of the declarant, the name of the mother, the name, gender and birth date of the child, and the names, ages and occupations of the witnesses. It was signed by the magistrate, declarant and two witnesses. The declarant could be male or female, the witnesses had to be male. If the name of the child changed afterwards (e.g. because of adoption or legitimization), there will be a remark in the margin of the birth act stating the new name, the date of and the reason for the change. For privacy reasons, birth acts from the last 100 years can not be consulted. Deaths had to be registered within three working days, by two male declarants who had first-hand knowledge of the death. Death acts usually contain the names, ages and occupations of the declarants, the name, age, usually occupation and death date of the deceased, the names of the parents (if known), whether the parents were still alive and if so, their place of residence, the names of former spouses (if any) and whether the marriages ended by death of the spouse or divorce, and the name of the current spouse (if any). Acts were signed by the magistrate and declarants. For privacy reasons, death acts from the last 50 years can not be consulted. All marriages have to take place before the magistrate. Church marriages are not valid, and indeed not allowed unless a civil marriage exists. It is common to marry before the magistrate and in the church on the same day (but always first before the magistrate). Marriage acts contain a lot of genealogical information: It lists the names, ages, occupations and residences of both spouses, their parents and the witnesses. Acts were signed by the magistrate, both spouses and four witnesses. If a spouse was under 30, their parents had to give permission for the marriage, and they would also sign. If the marriage ended in divorce, there will be a remark in the margin stating the court that declared the divorce and the date of the divorce. For privacy reasons, marriage acts from the last 75 years can not be consulted. Bride and groom had to provide a number of documents before they could be married. These documents, called huwelijksbijlagen (marriage supplements) were kept with the marriage act. They are still accessible to us, and can be a genealogical treasure trove. These documents should at least include extracts from the birth acts of both spouses. Sometimes, that's all there is, but often there are many more documents. The groom had to provide documentary evidence he had fulfilled his conscription obligations (which does not necessarily mean active service). If the marriage was not their first, there should be documents proving the death of (or divorce from) earlier spouses. If one of the spouses were not yet 30 years old, and their parents were dead, they had to prove this, as their parents had to give permission for this marriage. Sometimes you will even find documents proving the death of grandparents (who had to give permission in place of the parents, if the parents were dead). A variety of other documents may have been added to the marriage supplements. For privacy reasons, marriage supplements from the last 75 years can not be consulted. Nationwide censuses have taken place on a regular basis since 1828. However, information in censuses outdates quickly, and local magistrates needed a better system to keep track of their inhabitants. In 1850, the population register was introduced. It contained the same information as earlier censuses. For each address, the occupants were listed, with birth dates, occupations and family relations. It was kept up to date: Changes of address and occupation were added, as were births, deaths and marriages. Pages would get messy because of all those changes, and from time to time the register was closed and a new register was started. Registers were written in bound folios. Early registers were sorted on address, later registers on family name. Around 1900 (earlier in some towns, later in others) the bound registers were phased out and replaced by a loose-leave system known as gezinskaarten (family cards). A full (or messy) page could easily be replaced, or an additional page could be added. This system was in use until 1939, when they were replaced by so-called persoonskaarten (person cards). These cards are beyond the scope of this article. Because of all the copying and changing, the population registers contain a lot of errors. Birth, death and marriage dates we find in these registers should always be checked against the acts of the civil register. The population register does contain a lot of information not easily found elsewhere: It lists complete families, it contains addresses and occupations, and it often contains remarks that were for some reason relevant to the magistrates. These remarks can put you on the track to some interesting facts about your ancestors, like bankruptcies, insanity or imprisonment. For privacy reasons, persoonskaarten can not be consulted (but an extract can be obtained, for a fee, if the person is deceased). Other population registers, including gezinskaarten, are accessible to all. Because of the privacy restrictions on birth and marriage acts, the population register is the most important resource for genealogy research in the early 20th century. Churches started registering baptisms and marriages in the 16th century. Many of the earlier registers were lost, but they generally still exist from the mid-17th century onwards. In 1811, most church books were confiscated by the state to form the basis for the new civil register. Pre-1811 church books are still state property and are easily accessible in Dutch archives or family history centres. Later church books are usually still owned by the churches and are often hard to find and hard to access. The most important churches were the Dutch Reformed Church (the state church) and the Roman Catholic Church. Protestant church books are usually in Dutch, catholic church books in Latin. Baptism records usually contain the name and sometimes gender of the child (or the Latin form of the name for catholic baptisms), the names of the parents, the names of one or more witnesses and the date of the baptims. From the late 18th century onwards, the date of birth is usually also listed. Information in early records can be scarce - sometimes nothing more than the date of the baptism and the name of the father. Catholic children were usually baptized within 24 hours after birth, protestant children on the first or second sunday after birth. Baptists were of course an exception: They were baptized in adulthood. The only major group that were not baptized at all were the Jews. Marriages were only allowed in the Dutch Reformed Church, in the French-language Walloon Church and before the magistrate. Catholics often married in their own church anyway, usually after a civil or protestant marriage. Always check the marriage books of the Dutch Reformed Church, even if your ancestors had another religion. Funeral registers contain very limited information. For children and women often even the name is missing, it just lists "the wife of..." or "a child of...". Later records (from the late 18th century onwards) usually do contain names and death dates. Occasionally, funeral records will also list the cause of death. Pre-1700 church books have many omissions, but the vast majority of the other records described above have been conserved and can be consulted today. There have been, however, some important losses, mostly through fire or acts of war. In 1766 fire destroyed most of the village centre of Hilversum, including the Dutch Reformed church. Not only the church books were lost, but also the archives of the local magistrates and the local court, making it almost impossible to trace protestant ancestors from Hilversum that lived and died before 1766. Fire in Alkmaar in 1890 destroyed the archives of the courts of Alkmaar and Hoorn. Losses included the civil registers of the area. Birth, death and marriage registers were kept in duplicate, and the other copy can still be consulted. But other registers and the marriage supplements are lost, as were of course the registers of the courts. Because of heavy fighting in May 1940 in the area around Middelburg, the capital of the province Zeeland, Middelburg was heavily damaged. Many of the church books for the province Zeeland were lost. The population register of Arnhem was lost during the battle of Arnhem in 1944. In March 1945, English bombers accidentally bombed the Bezuidenhout region of Den Haag (or The Hague). Civil registers for the years 1843-1944 were lost for the Den Haag and Leiden regions. Duplicate registers are still accessible, but marriage supplements and registers without a duplicate are lost. Did this article help you to trace your Dutch roots? Let me know - sign the guestbook or leave a message on the feedback page.